Coastal Bend College Board of Trustees hosted Dr. Thomas Rasco, former president of Texarkana College in Texarkana. Rasco is the first of five candidate interviews for the position of college president for Coastal Bend College, located in Beeville, Texas, with campuses in Alice, Kingsville and Pleasanton, Texas. 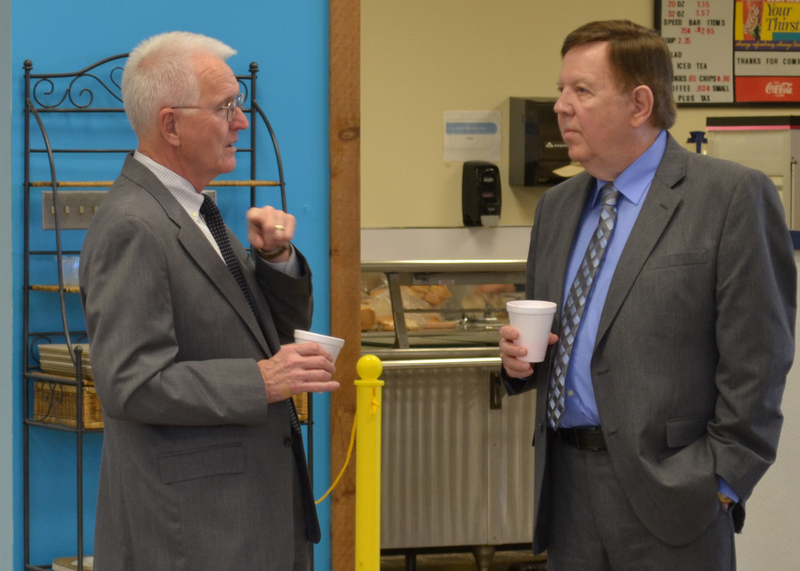 Dr. Thomas Rasco; Coastal Bend College Interim President Dr. Jimmy Goodson chats with presidential candidate Dr. Thomas Rasco during a reception held in his honor. Rasco met with college officials, staff and faculty, and the community at large during several forums throughout the day. He spoke to each group about tying strategic planning to budgeting and developmental education. He also addressed retention, graduation and student success in community colleges. When asked how he would manage a multi-site institution, Rasco acknowledged the challenges of keeping all campuses informed and said that communication is his priority. “Communication is very important from the main campus to satellite campuses. It is important for the president to be the face of the college and seen on each campus. It has to be a priority and a goal,” Rasco said. Communication models, committees and councils, and distance learning environment are a part of that package and Rasco said, as president, he’d like to include his success in communicating with stakeholders as part of his evaluation. He called students and faculty the “powerhouse” of an institution. As a current (Walden University) faculty member who has served on a faculty senate, Rasco expressed his understanding of challenges faced by faculty members and his desire to create an equitable environment for all staff and faculty. Previously, Rasco served as President of South Arkansas Community College in Eldorado, Ark. Rasco holds an Ed.D. in Educational Administration from Baylor University, Waco, a Masters in Speech Communication and Management and a Bachelors in Behavioral Science from the University of Houston, an Associate of Arts and Sciences in Nursing and an Associate of Arts and Sciences in Respiratory Therapy from Odessa College in Odessa, Texas. Candidates forums held this week to give the public opportunities to meet the five finalists for the position of college president. Two forums are held each day for staff, faculty, students and the community, including the media, on all campuses. Dr. Karen Bleeker served as the President of the Community College of Denver in Denver, Colo. Previously, Dr. Bleeker was Vice President of Educational Services at Temple College in Temple, Texas. Dr. Bleeker holds an Ed.D. in Educational Administration and Community College Leadership from The University of Texas at Austin, a Masters in Counseling from the University of Texas at San Antonio, a Masters in Adult Education from the University of the Incarnate Word in San Antonio, and a Bachelors in Sociology from Trinity University in San Antonio. Dr. James Cargill serves as the President of Dawson Community College in Dawson, Mont. Previously, Dr. Cargill served as Chief Academic Officer at Ashland Community and Technical College in Ashland, Ky. Dr. Cargill holds an Ed.D. in Music Education from the University of Houston, a Masters in Musicology and a Bachelors in Music Education from Sam Houston State University in Huntsville, Texas.